Those are sets of neckwarmer + mittens (scarf +mittens) for a special occasion, all luxurious, sweet, and exquisite. 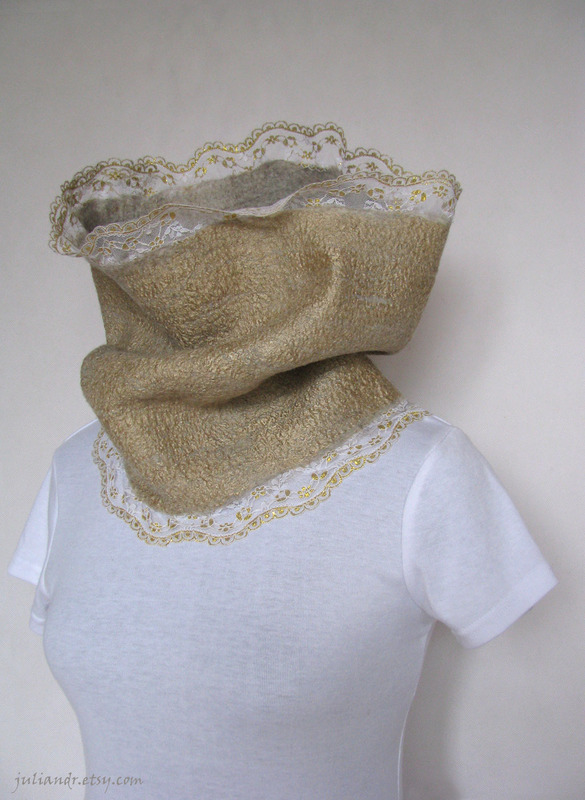 Neckwarmers measure approximately 36x30 cm without lace fringe ---> 14"x11,8". All three sets are made of pure undyed British Bluefaced Leicester wool, covering all three colors in the color range of this breed: ivory white, oatmeal gray and dark (humbug) gray. The face of Beige neckwarmer is covered all over with golden muga silk threads, but on the flip side you can still see oatmeal gray.. The lace was attached to woolen basis while felting and got organically entangled with it, hence those mittens and neckwarmers are absolutely seamless and solid.